Okay, folks. I've been wanting to write this post for a while now, and I'm finally sitting down to do it! Since I started couponing several months ago, I've managed to find my groove (so to speak), and have been consistently saving 40-50% on my grocery bill every single week. I typically spend $50-$70 per week, so that level of savings isn't too shabby, if you ask me. I thought I'd give you an outline of what I do every week before I head out to the grocery store—and I promise you, it's not as intimidating as you may think. All in all, I'd say I spend no more than an hour, one day a week. I first add any special offers on the Personalized Deals section of the Vons website. These are things that aren't offered to every customer, so this is the only place I will find them! I find great deals on things I buy on a regular basis, and they also have a few recommendations of things I may also be interested in buying. I love this section, because I can get things like fruit and veggies for ridiculously cheap. They also include special discounts here (like $3 off $10 produce purchase). I'm sure to match up any other deals with any coupons I know are tucked into my coupon folder! Next, I go back to the Krazy Coupon Lady website to see the best discounts from that week. I print out any coupons they link to that I don't already have from the paper, and add them to my coupon stack for my shopping trip. Many of the coupons can actually be added to my card from the Coupon Center section of the Vons website, which is easy peasy! I am sure to check for any freebies that Vons may be offering and will add them to my card (they seem to do this 1-2 times a month, and I've gotten everything from free simmer sauce to free salsa!). The last thing I do is check the Your Club Specials section of the Vons website. This will tell me which items I've purchased in the past are currently at a discounted price. This is where I find a lot of my best savings! If I don't have a paper coupon to match with these discounted prices, I usually do a google search for a current printable coupon. A lot of times you will end up finding out-dated couponing blog posts and other annoying things, but sometimes you hit the jackpot! A lot of name brand companies offer coupons on their websites/social media outlets (I've had good luck with Birdseye and Morningstar). Oh! I'm also sure to look for sale prices and/or coupons for any go-to items that are almost always on my list and may not pop up anywhere else (eggs, bread, deliciously flavored coffee creamer, etc.). I always bring my coupon folder (with all my coupons), even when I already have the ones I plan to use set aside with my shopping list. There are often deeply discounted items throughout the store that I'm able to get for crazy-low prices, but since they aren't posted anywhere else, I wouldn't have known to bring a coupon I may have! I typically take a quick look in the clearance sections (I've found Eisley's favorite Annie's fruit snacks for 50% off!) and the beauty/lady product aisles each week for any un-advertised deals. Stick to the list, mmmkay? That is, unless you find something for a price you can't beat. I've found that list-making, meal planning (more on that another time), and couponing has reigned in many impulse buys that used to add a lot to my weekly bill. Check your receipt after you shop. Always. I was recently over-charged for a few things, and had to go in to get some money back. It feels like a drag, but after putting in a lot of effort to maximize my savings, I'm not about to pay $7 for five apples. I mean, really. You don't need to start getting the Sunday paper if you're just starting out couponing. I've been amazed at how many printable coupons are the exact same as those I find in the paper! For me, personally, I'd say each week about 25% of my coupons used are paper coupons—the rest are added to my club card or are found online and then printed. Rarely is there something on my receipt that isn't on sale. And if it isn't on sale, I've used a coupon. (The goal is to combine sale prices WITH coupons, but that isn't always possible.) Once you start couponing, you'll learn how much money products are actually worth (for instance, I will never pay more than $1.50 for any type of breakfast cereal) and how often your favorite/most used items are available at those prices. You'll learn when to stock up, and when to wait for a better price! I'll write about this more later, but the whole point of couponing isn't to get a closet-full of mustard, paper towels and granola bars. It allows you put your hard-earned money into the things you want to spend more on, but may seem out of your budget (organic milk, produce or meat), and is also a great lesson in organized and intentional shopping. That's important for everyone, I think. So, are you overwhelmed yet? Right. I thought so. I tend to be a bit wordy when I'm attempting to be thorough. My recommendation is to start slow, become familiar with your favorite grocery store (their policies, club card options, and their weekly specials), be sure to check online for printable coupons and extra-low prices each week, and start list-making! I'll be doing more posts like this in the future, to hopefully break it down a bit. But for now, I wanted to at least share my weekly process—and encourage anyone who thinks couponing isn't for them that it totally is. You can do as little or as much as you want. But I figure if you even save $10 a week, that adds up to more than $500 a year. BOOM. Do you have any questions? Share them in the comments and I'll be sure to respond! I'm a little over-eager when it comes to getting other people to hop on the couponing bandwagon. I'm this close to buying each of you a couponing folder. Watch out. This isn't overwhelming at all - it is SO HELPFUL! I've been thinking recently that I really really need to make better use of coupons but was totally intimidated by those coupon sites. Thank you! $1.50 for cereal! That's incredible! I'd love to know what other products you've found to be ridiculously overpriced. 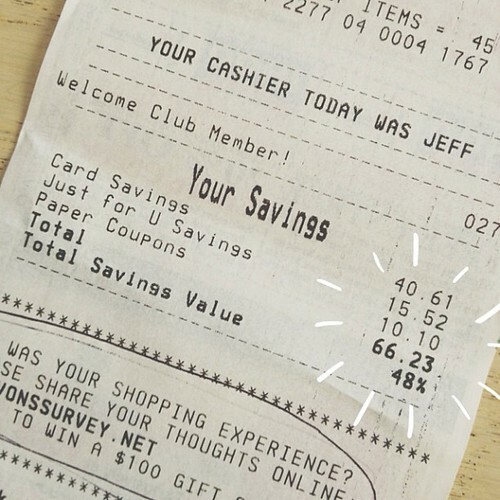 I love the term 'moderate' couponing- I've been doing it for some time- just this past week I saved $65 on my grocery bill ( I think that's my highest savings yet!) I used to get so overwhelmed at the grocery store but now I sort of see it as a fun game/challenge to get the lowest prices possible. Good tip about googling to find a brand name coupon for something you need-- I've also had a lot of luck by following the brands I use a lot on facebook/twitter and they'll release coupons on those sites exclusively. Such a great breakdown of getting good deals! I'm moving to the US in a few weeks and I am a little bit freaked out by the high cost of living. It's so great to know that I can save a bit here and there to help out. You made it seem really simple, doable, and organized. I feel way less overwhelmed after reading this than I did just thinking about it before! This is something that I most definitely need to start doing. I'm just bummed that the Krazy Coupon Lady hasn't updated my favorite store since July. Maybe there's another blog out there that does though! So, I have avoided couponing because, frankly, I am lazy and it seemed awfully consuming and overwhelming. And now after reading this? I bothered to register my Kroger card (which seems so weird, coming from California and I want to call them Ralphs still) and am like MIND BLOWN with the KCL website. And then found a coupon for something from Whole Foods, where we go often, that we would actually USE. =D Guuuurl, you're changing my life over here. Oh, yaaaay! So happy to heart it! Truly, the KCL website is what encouraged me to actually try couponing for myself. They make it so simple, no matter where you shop or how much time you have to put into it. Let me know when you're coupon-binder status, because I may be getting there pretty soon. LOL. I love, love, love your couponing tips! I also love that you can get so many savings by adding them online to your club card these days... so convenient. I know, this might be an irrelevant question, because people just eat differently and have different preferences... but how in the world do you only spend $50-70 a week for two adults and a toddler? I know you don't buy meat (right? ), but even if I substract that from my final bill, I don't get that low (I usually spend about $120-140 per week). Curious! In addition to my weekly trips, we also make 1 or 2 trips to Costco each month. All-together, I'd say we spend around $100/month at Costco (although I'm terrible at estimating these sorts of things…). :) Since I started couponing, I stock up on so many basics, so most weeks I don't have to get items for every meal I plan on making. I think that is cutting down on my weekly totals, too! And I know what you mean about adding deals to your cards…such an easy way to get good savings. I love it! I've been doing the moderate couponing thing too. Checking the sale papers & combining the coupons I have & meal planning around that. One thing I've found that totally ruins the mojo: taking the hubby along. I can usually shop for anywhere from $30-50 a week for both of us, but when he tags along, we always spend $70-90. I checked out behind a crazy coupon lady yesterday. Her bill went from $340 to $200 after coupons, but seriously? Who has the time for all that? Or the space for all the random stuff she had in her cart! Oh, I totally spend more with Jay, too! Isn't that odd? I feel like when he's there, I find a reason to get a lot of things I didn't plan on buying. It's probably a good thing I do 99% of the grocery shopping by myself these days! :) And your spending $30-$50 per week is AWESOME. Glad to hear it's working for you, as well!